The world of Pokemon has taken the world completely by storm. Way back in '95 the first two games (Pokemon Red and Blue) for the GB started probably the biggest craze the world has ever seen. After the two games many others for the GB have been realised, along with Pokemon Snap, the first Pokemon N64 title. Pokemon have also been a cartoon series, a movie, on clothes, cards and just about anything else you can think of. Now the Pokemon return for their second N64 outing, so grab your poke ball and join the fun. The main part of Pokemon Stadium is to take the battling in the GB games and turn it into 3D. With the transfer pak that the game comes with, you can load up your pokemon from red, blue or yellow. With these pokemon you can then enter them in battles and watch all their moves in glorious 3D. If you don't have Pokemon on the GB, or your aren't good enough then you can choose to take some rental pokemon. Playing Pokemon is very simple. First pick six , then look at the opponents pokemon and choose three of the six pokemon that you think would be best at taking on three of your opponents pokemon. Once in the battle decide if you want to attack or change the fighting pokemon. If you choose to change your pokemon, then get one of then out there, if you want to attack, then select one of the four moves that your pokemon has. There are many different types of battles you can participate in. 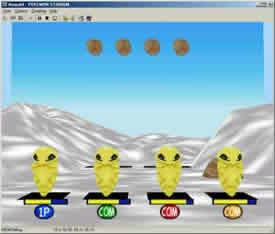 Some of the options to play are 'Battle Now' which just chooses some random pokemon for you and then pits you against a computer player. Then there are 'Event' battles in which you and three friends can battle it out. The main option is Pokemon Stadium. Here you can choose either the Prime Cup, Poke Cup, Petit Cup or Pika Cup, each with different rules to play. The last option is Gym Leader Castle. The Gym Leader Castle is just like playing all the Gym leaders in the pokemon games on the GB. There are three trainers to beat before you get to the actual leader of the gym though. Although some might complain that Pokemon Stadium need a mode like the ones found in the GB, there is a feature which makes up for this. Choosing the GB Tower lets you play your GB game on the N64. This mode makes up for the lack of one to go with the actual game. But Pokemon Stadium isn't just all about battling, there is also a Kids Club in the game. This is nine mini games, like the ones found in Mario Party, and are great fun to play with three friends. My personal favourite is Run, Rattata, Run which sees you as a Rattata trying to run along a treadmill as fast as you can, while jumping over any obstacles that you come across. Along with the other mini games, this option is a great diversion for anyone tired of battles or who just wants to relax with some mates. While the graphics in pokemon stadium are astounding, this cannot be said for the sound. The music is boring and repetitive, sound effects don't give the impression that it is real and it is all low quality. One thing that does give the sound some points is the amount of speech in the game. During battles some of the best commentary I've ever heard in a game gives insights into what is going on. Unfortunately like all game commentary, it starts to repeat itself over and over again. The graphics on the other hand are fantastic. The animations are fluid and life like, the special attacks are breath-taking to watch and the colours are put to great use. One thing missing from the game are spectators in the crowd and to be able to see the trainers you are battling. Overall this game proves why pokemon is such a huge craze. The game is addictive and there is so much to do that you won't be putting this game away for awhile. Although much of this games appeal is lost if you haven't played any of the other games (is there anyone out there who hasn't? There must be someone) newcomers will soon catch on. If Nintendo keep making games like this then pokemon will still be around for years to come. 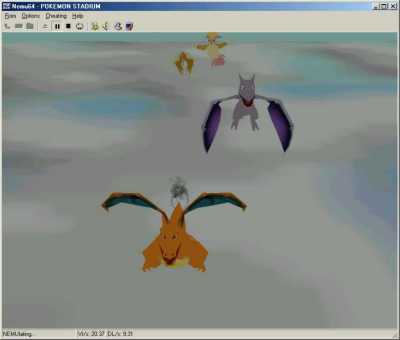 This game is lots of fun to see your well trained Pokemon battle it out in 3D, but at the moment no one has released an emulator for the transfer pak. This makes playing Pokemon Stadium on emulators pointless and boring. The game is just not as fun as it is meant to be.